The prevailing story of the origin of the potato chip starts in Saratoga Springs, New York, a historically affluent and resort community. It was 1853, eight years before the beginning of the Civil War. Known for its mineral springs and their supposed rejuvenation properties, Saratoga Springs had just started becoming a tourist destination with help of the railroad that cut through the town. Resorts, inns, restaurants, and spas had begun to crop up along the shores of Saratoga Lake. Moon’s Lake House, owned by Cary Moon, was one of the finest of those restaurants. Vacationers and wealthy summer home owners visited the restaurant often. 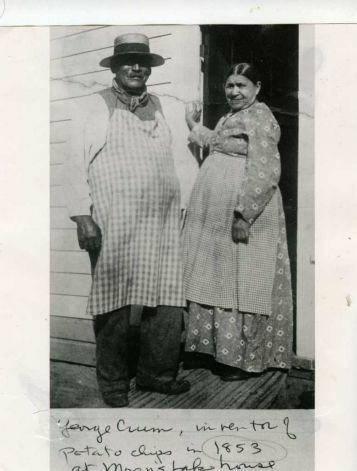 At the restaurant, two people shared the cooking responsibilities, Catherine “Aunt Kate” Weeks and her brother (or brother-in-law, depending on who’s telling the story), George Crum. George was born George Speck, his mother was Native American and his father was a free African-American making a living as a horse jockey. When George was a young man, he adopted his father’s horse racing name – Crum. After an earlier career as a trapper and hunting guide, he made his way to Saratoga Springs, where he began cooking and, by all accounts, seemed to get pretty good at it. So good, in fact, he was hired by Cary Moon to work at his restaurant. Up to this point, based on the evidence at hand, we can be fairly certain all of this is true. But here’s where, perhaps, elements of legend creep in. The story goes that it was about dinner time during Moon’s second summer season on the Lake. A customer came in and ordered Moon’s Fried Potatoes, the well-known house specialty. Crum whipped up a batch and served it to the customer, who complained that the potatoes were cut much too thick. So, he sent the item back to be remade. Crum did his best to make them thinner, yet when the discerning patron got his second order, again he complained that the thickness of the potatoes weren’t to his liking. So, once again, the customer told Crum to try again. Crum, none too pleased that someone would insult his cooking, cut the potatoes paper-thin, dumped them in a vat of oil, let them cook so long that they became hard and crispy, and then salted them heavily, thinking that these “fried potatoes” would now be inedible. When served the item, the customer took a bite…and then another…and then another, before proclaiming that the fried slices of potatoes were delicious. It became known as the “Saratoga Chip.” The potato chip was born. As one could imagine, there are several versions of this story and all are disputed. First off, assuming the story is true, there is the question of who this customer actually was. The less interesting account was that it was simply a regular (albeit whiny) farmer, hungry from a long day out in the fields. The more famed tale is that the customer was shipping and railroad mogul, Cornelius Vanderbilt. Another version of the tale involves Crum and his sister (or sister-in-law) “Aunt Kate” Weeks. In a 1940 article from the Saratogian written by the town’s historian at the time, Jean McGregor, it claims that Weeks was actually the one to accidentally create the potato chip. In this story, Weeks was making pastries, frying them in a vat of fat. She was also peeling potatoes in attempt to multi-task. Well, a slice of potato fell into the fat and when she fished it out, Crum saw the greasy potato sitting on the counter and took a bite. It was so good that Crum said they need to sell them, which they did for ten cents a bag. So what’s the truth in all this? It’s always possible Crum may have served potato chips at some point whether at Moon’s Lake House or later at his own restaurant which he opened in 1860. (It was a popular item in the area later in his life; it’s been claimed he commonly served baskets of chips on tables as an appetizer for guests.) And he may have even invented his own version of it, even possibly being ignorant of any other. But this all seems unlikely as, if he had invented it, one would think he would have claimed this fact at some point to help promote his restaurant, given the eventual popularity of “Saratoga Chips.” Further, the New York Tribune in 1891 did a write up on Crum’s restaurant, Crum’s House, and made no mention of anything remotely resembling potato chips being served there, which also calls into question the claims that he served the chips as an appetizer to all guests. Perhaps most damning of all is that Crum commissioned a biography of his life to be written in 1893- in it there is not one mention of him inventing potato chips. But whatever the case, no one from Saratoga Springs can really claim they were the first to make potato chips, though the chefs in the town did help popularize it. 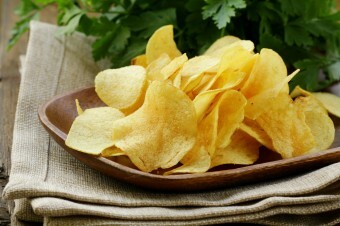 (“Saratoga Chips” was even a relatively common name for potato chips up until around the mid-20th century). But it seems the potato chip was invented earlier in the 19th century in Europe, and possibly before. After all, potatoes were a very common food (often fried) throughout the UK, France, and Belgium particularly. It’s hard to believe they were never thinly sliced, salted, and deep fried prior to 1853. And, indeed, Englishman William Kitchiner’s famed 1822 cookbook Cook’s Oracle has a recipe for “Potato Fried in Slices or Shavings.” The recipe is extremely close to the original Saratoga Chip, having the chef cut the potatoes in “shavings round and round… dry them well in a clean cloth, and fry them in lard or dripping… send them up with a very little salt sprinkled over them.” This cookbook was a bestseller in both the UK and in America and was published six years before George Crum was even born. Beyond that, there are several other cookbooks that featured essentially the same thing before Crum supposedly invented them, for instance, The Virginia House-Wife by Mary Randolph (1824) and Alexis Soyer’s Shilling Cookery for the People (1845), among many others. Despite all the varied versions and lack of documented evidence, the “Saratoga Chip” is still very much part of the town’s identity today. No matter if the potato chip was invented originally in Saratoga Springs or not, this writer, from experience, can vouch for its tastiness- it really is one fine potato chip. Are French Fries Really French? Potato chips saw a huge burst in popularity outside of being served in restaurants thanks to former nurse and lawyer, Laura Scudder. (Scudder was also the first known female attorney in Ukiah, California.) Scudder eventually moved to Monterey Park, California and started a business in 1926 selling various food items, including potato chips. As you might expect from the date, and from the fact that she was a woman in an era when women weren’t generally welcomed as business owners, her business struggled a bit at first due to the Great Depression and that many companies refused to work with her; even getting insurance for her businesses’ truck was an issue until she managed to find a female insurance agent. At this point, shelf life for the chips was generally poor, due to lack of effective packaging. They were usually sold in bulk in cracker barrels or tins, neither of which was ideal. Beyond the poor shelf life, chips at the bottom also tended to become crushed. Scudder got the bright idea to have her employees iron wax paper into bags which they could then put the chips inside and seal shut. This method worked amazingly well and helped make the former popular restaurant item something consumers could buy and store effectively at home. Needless to say, she soon had a whole fleet of trucks that needed insured, and of course stuck with the lone insurance agent in her area willing to work with a female business owner at the time. She would later sell her business for $5 million or about $43 million today (though turned down a $9 million offer because the buyers wouldn’t guarantee her employee’s jobs). At its peak, her business would go on to gross well over $100 million in sales annually. Another innovation of Scudder’s was to put the date the item was packaged on the chip bags, so consumers could make sure they were getting fresh bags. Today, chips are typically stored in plastic bags filled with nitrogen, which simultaneously helps keep the chips from getting crushed during shipping and keeps them fresher even longer. Yeah, you said it all !!! If the invention was in 1853 then Mr Crum must have had a time machine because someone travelled back to 1817 and gave it to William Kitchiner who included it in his cookbook, The Cook’s Oracle first published in 1817 (original copies still exist). This is the earliest known recipe for the Crisp or as Americans call it the Potato Chip. Mr Kitchiner does not claim it as his creation so we have to assume that it was known to him and others before that date. Unfortunately the origin of this food delicacy like so many others will probably always remain a mystery, so the above is not the truth or anything near the truth. Its a nice story but it’s a fantasy. run me over or stab me. What are you talking about my comment was nearly a month ago. Get a grip. Anyway this story was about potato chips not guns. Potato chips make very poor firearms they tend to crumple when subjected to black powder explosions and don’t work very well as projectiles. this is about potato chips/crisps you stupid childish fool. I live in the US, Im English…. its a shame people in the US get such a bad wrap because of complete idiots like you. Its a FACT guns are far too rasy to obtain… Im not for banning guns but comparing gun deaths to cars is pure lunacy. I dont believe you can really hide a car in your pocket, and take a split second to pull a trigger…. like any idiot can do. You are only trying to discredit this because he is black.